Ample Zen is a theme for Emacs 24. It is my combination of ample-theme by Jordon Biondo (https://github.com/jordonbiondo/ample-theme) and Zenburn-Emacs by Bozhidar Batsov (https://github.com/bbatsov/zenburn-emacs). Credit goes to them, as they did the hard work. 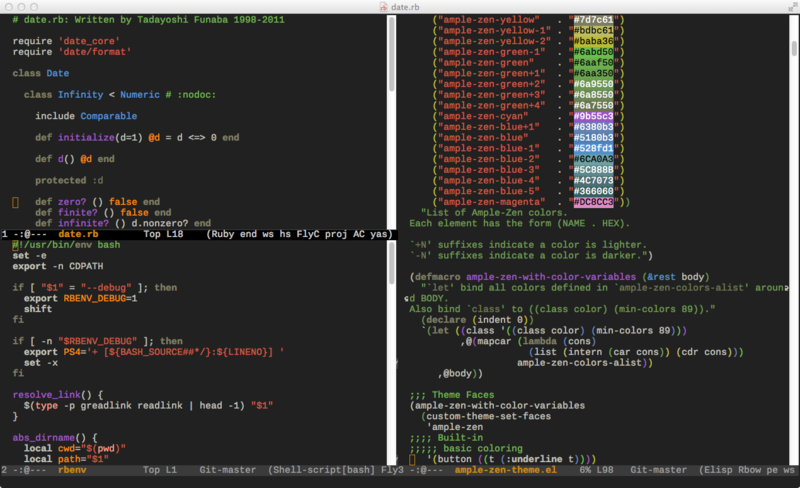 I wanted to combine the colors of AmpleTheme and the robustness of Zenburn-Emacs. It has been tested on Mac OSX 10.8 on both the GUI and terminal. This is my first attempt at a theme. If you have the Marmalade configured, you can install this package with the following. At the time of this commit, a pull request has been merged to MELPA. At some point, package-install ample-zen-theme should work from there as well.